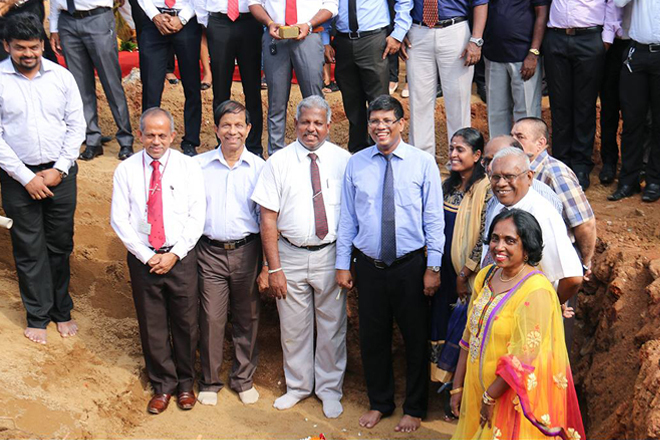 Blue Ocean Group is pleased to announce yet another iconic luxury condominium project at No.35, Ramakrishna Road, Wellawatte, and the foundation stone laying ceremony took place at the site on the 11th of October 2018, headed by Sivarajah Thumilan, Blue Ocean Group Chairman in the presence of a large number of guests. The special event of the function is to sign the Purchase Agreements by the customers in confirmation of their reservation of apartments to avoid any disappointment later. We take this as a clear evidence of the trust we have earned in the trade from a large number of customers we have served so far and many more yet to be served. Ramakrishna Road complex will have 45 apartment units in 10 Residential Floors with 5 Levels Carpark. This apartment complex is designed by a team of renowned foreign and local construction engineers and architects, conforming to international standards. The entire job will be entrusted to skilled craftsmen, under the strict supervision and guidance of well-experienced professionals. By using premium quality building materials at every stage and with the best construction techniques applied throughout the end product will stand as another masterpiece for Blue Ocean Group. Located on the seaside, just opposite the historical Ramakrishna Mission, gifted with ample warming sunlight, gentle fresh air and clear view of the sea makes the livelihood so smooth, pleasurable, hygienic and peaceful. It will not be a wonder if the residents of this complex are driven to a feeling of being carried far away from the dusty, noisy and irritating city life. Having close access to important landmarks such as leading schools, reputed hospitals, supermarkets, banks, public & private institutions and easy access both from Galle Road and Marine Drive are great advantages. Knowing the value of this architectural marvel, reservations had started flowing in and we expect all 45 apartments will be booked before long. Blue Ocean Group conquered two prestigious international awards in 2017 as “Sri Lanka’s Best Developer” and as “Asia’s Greatest Brands and Leaders” organized by PropertyGuru, in Singapore. In addition, the Group earned awards for Best Interior Design, Condo Architecture Design and Sustainable Development. In 2018, the Group earned eight awards including multiple nominations for the Special Recognition in Corporate Social Responsibility, Best Mid End Condo Development, Best Affordable Condo Development, and Best Condo Interior Design. PropertyGuru is Asia’s foremost online property company which initiated Asia Property Awards series 13 years back and the award show has earned an unparalleled reputation for credibility and transparency as the entries are judged through a rigorous and fair process by an independent panel of renowned industry experts. Blue is Ocean presently engaged in 35 mega projects in 10 major cities. Among them 07 projects were completed between January – June 2018, valued Rs. 4 Billion, 06 projects completed by end of August 2018, valued Rs. 6.3 Billion, 06 running projects in hand, valued Rs. 11.5 Billion, 07 projects were designed, valued Rs. 14 Billion and another 15 on-going projects, valued Rs. 20 Billion, all of them totaling to approximately Rs. 55 Billion which is counted as a tremendous record for a private company in the real estate industry of the country.